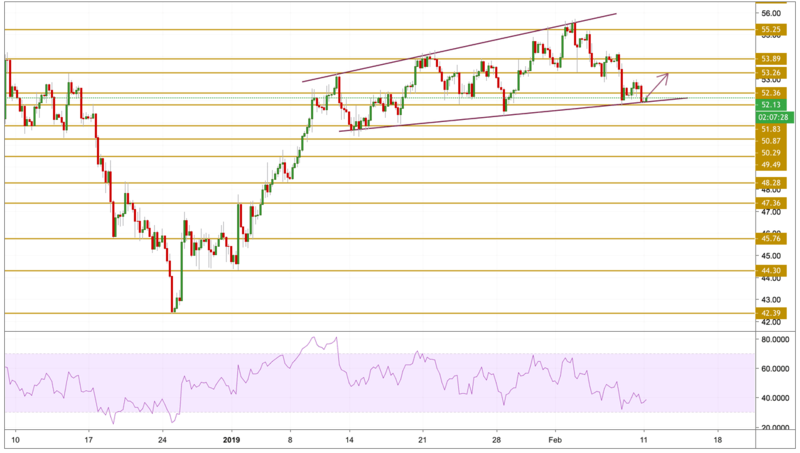 Crude oil stayed under pressure throughout last week as investors started to price the potential negative impact of the global economic slowdown on the oil demand outlook. Both the European Commission and the BoE slashed their 2019 growth expectations citing geopolitical factors such as the ongoing trade conflict between the U.S. and China and the uncertainty surrounding Brexit. Moreover, reports that President Trump is not planning to meet his Chinese counterpart Xi before the March 1 deadline, weighed negatively on the black gold and helped extend the slide. Additionally, the Baker Hughes' report on Friday showed that the total number of active oil rigs in the US increased to 854 this week from 847, adding more pressure on prices as production increases. After facing a strong resistance from the $53 level, Crude prices declined again to the lower band presented on the chart, which in case of a breakout, could trigger a reversal. However, the divergence between the momentum and the price, points towards an upward move that will most likely let the $53 resistance level to be violated. The next level we will be watching is the $53.26 level.